Analysts Debate: Is Visa Still a Top Stock? Three analysts debate whether Visa will charge forward or if investors will put a stop on this payment processor. In that spirit, we three Fools have banded together to find the market's best and worst stocks, which we'll rate on The Motley Fool's CAPS system as outperformers or underperformers. We'll be accountable for every pick based on the sum of our knowledge and the balance of our decisions. Today, we'll be discussing Visa (NYSE:V), the world's largest electronic payment processing network. Source: Yahoo! Finance, Visa quarterly report, mrq = most recent quarter. There is no such thing as a riskless investment, but I have to admit that Visa comes extremely close. Aside from a global recession, Visa has positioned itself in multiple respects for sustained low double-digit growth. To begin with, Visa and its biggest rival MasterCard are merely payment processors. American Express and Discover Financial Services act as both payment processors and lenders, which allow them to double-dip in profits, but it also exposes them to bad debt write-offs if the economy weakens and consumers stop paying their bills. As simple as payment processing sounds, it leaves Visa and MasterCard with no bad debt exposure and the freedom to grow with little risk. Visa is also making big inroads overseas. The majority of global transactions are still conducted in cash, which leaves a moat of opportunity in emerging markets. In its most recent quarter, cross-border volume grew by 10%, which I believe should be a fairly consistent baseline for the company moving forward. Prepaid debit cards are another of immense opportunity for Visa because many people had their credit harmed during the financial crisis. With annual prepaid debit card growth of 15% to end last decade, it's still a solid growth opportunity that's still largely untapped. Finally, Visa has done a great job of returning money to investors via a dividend that's more than tripled over the past four years. It's also added billions in share repurchases which reduce the outstanding share count and make the company appear cheaper relative to its profits. You can read a more detailed analysis about the key points that make me feel confident about Visa's future by clicking here. However, in a one sentence summation, these factors make Visa a perfect buy-and-hold candidate. In the long run, it makes sense to bet on the expanding use of credit cards around the world. As Sean pointed out, most transactions are still done in cash, but there's plenty of room to expand in the non-cash transaction volume before Visa even needs to consider chipping away at all those cash payments. In North America and Asia, 60% of the non-cash payments are made with credit or debit cards, but less than 40% of non-cash transactions in Europe or the BRIC nations are credit-based. Simply expanding its reach in the extant non-cash sector would be enough to drive growth before an assault on the cash economy needs to take place. It's true that Visa is more expensive than its peers, but I've calculated a more normalized set of valuations discounting the one-time litigation charge that affected the company's 2012 results, and on those measures, Visa is valued quite similarly to MasterCard, a competitor half its size and with a very similar expectation of growth. You can read more of my reasoning by clicking here, but the gist of it is that I agree with my fellow Fools. 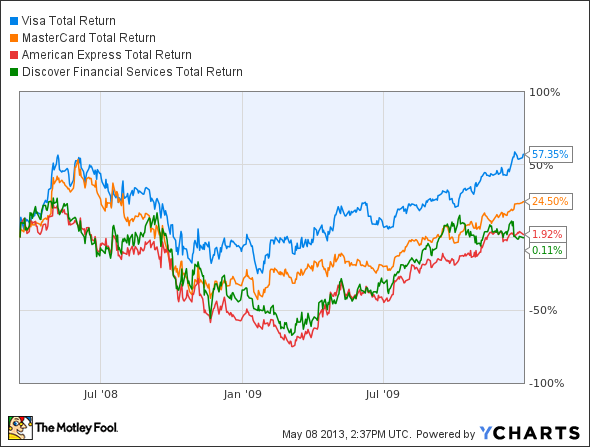 Visa has a great shot at long-term outperformance. Visa's real competitive advantage is in what's known as a network effect. Payment processors require merchants to have customers with Visa and customers require merchants that take Visa. Starting a payment processor is a chicken and egg conundrum and would be a nightmare to execute. But once you've built a payment processor network, it feeds on itself, drawing more merchants as customers sign up and more customers as more merchants sign up. To demonstrate the power of Visa's network effect, think about how ubiquitous Visa has become. I went to a liquor store about a month ago that didn't accept Visa, and I almost went into a tirade. How could a successful business not accept Visa? This is blasphemy, I thought. As a result, Visa has built a business that's nearly impenetrable by outside forces, and like Sean pointed out, it doesn't have to take credit risk. It's an expensive stock at 20.7 times forward earnings, there's no doubt about that, but great companies don't come cheap, and neither does Visa. I'll happily go along with an outperform call, and I actually think the combination of both MasterCard and Visa is really the right way for individual investors to play this great space. For more on my outperform call, see my full article here. That would indeed be a unanimous outperform CAPScall for Visa. Once again, the conclusion was the same for all three of us; however, the thinking that got us there took each of us down a different path. From Visa's network effect, which feeds upon itself, as Travis points out, to Visa's opportunity in non-cash transactions, according to Alex, and its incredible overseas opportunity coupled with its growing shareholder payback incentives, as I (Sean) noted, we are all led to believe Visa is the epitome of a buy-and hold selection. If you'd like a glimpse into our previous CAPScalls, I'd encourage you to visit our TMFYoungGuns CAPS page, where we are currently outperforming the market by 459 points on 26 (soon to be 27) active picks.